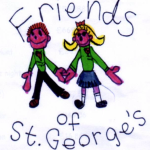 The Friends of St George’s is the parent teacher organisation of St George’s RC Primary School. 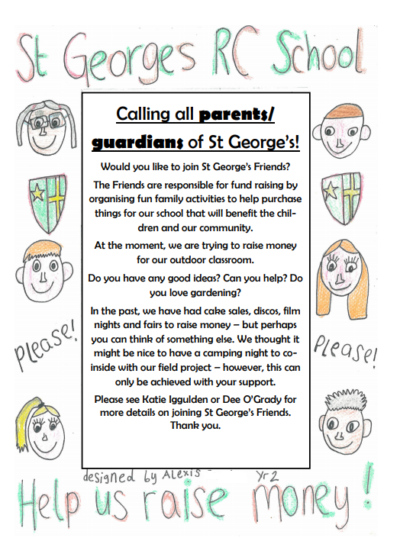 It is made up of parents, carers, friends and family members of St George’s pupils. It is a registered charity no: 1053061 and a member of PTA-UK. Our aim is to support the school by raising money for equipment and experiences which will enrich the education of all pupils. We do this in many different ways throughout the school year -providing refreshments at events, organising discos, cake sales Christmas fair etc. You can get involved in several ways. It is a great way to get to know other parents and families. A committee of about 6 members plan and organise events and run the Friends organisation. Volunteers help run events, setting up and clearing away. Pupils, family and friends come and support the events. Look out for details on the Friends’ upcoming events and activities in the school’s weekly newsletter and on posters around school. If you would like any more information, please have a chat with Katy Iggulden.